IOC President Jacques Rogge Visits WTF H.Q. 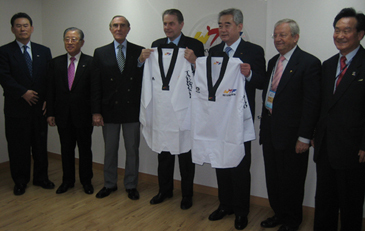 Dr. Jacques Rogge (fourth from left), president of the International Olympic Committee, poses with Dr. Chungwon Choue (third from right), president of the World Taekwondo Federation and chairman of the Seoul Organizing Committee for SportAccord 2006, and other WTF leaders when the IOC president visited the headquarters of WTF in southern Seoul on April 7, 2006. Dr. Rogge and the WTF leaders exchanged opinions on bilateral cooperation. 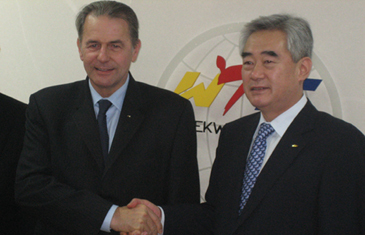 Dr. Jacques Rogge, president of the International Olympic Committee, visited the headquarters of the World Taekwondo Federation to exchange opinions with WTF leaders on bilateral cooperation in Seoul on April 7, 2006. On the final day of the five-day SportAccord 2006, IOC President Rogge met with Dr. Chungwon Choue, president of WTF and chairman of the Seoul Organizing Committee for the 2006 SportAccord convention, and other WTF leaders. It marked the first visit by the IOC president to the WTF Headquarters since Dr. Rogge became the president of the IOC in 2001. Among the participants in the one-hour-long meeting were Mr. Ivan Dibos, a member of the WTF Executive Council and IOC member of Peru; Mr. Phillip Coles, a member of the WTF Executive Council and IOC member of Australia; Mr. Dai-soon Lee, a vice president of WTF and president of the Asian Taekwondo Union; and Mr. Cha-sok Park, a vice president of WTF and president of the Pan American Taekwondo Union. Mr. Coles also serves as president of the newly created Oceania Taekwondo Union. Prior to the talks, WTF President Choue granted an honorary 10th Dan certificate to Dr. Rogge, along with a black belt and Dobok. Dr. Rogge was the second to be honored with the honorary 10th Dan, after Juan Antonio Samaranch, the honorary president of the IOC. On April 2, Dr. Rogge received an honorary doctorate degree in physical education from Kyung Hee University in Seoul. "IOC President Rogge expressed his deep interest in WTF's ongoing reform activities, especially the planned introduction of a new electronic protector system for fairer judgment and refereeing," Dr. Rogge was quoted as saying by WTF President Choue shortly after the meeting. Dr. Rogge was also quoted as saying, "If WTF continues its ongoing reform without fail, the future of WTF will be very bright and would have no problem being included as an Olympic sport in the program of the 2016 Olympic Games and beyond." Dr. Jacques Rogge (left), president of the International Olympic Committee, shakes hands with Dr. Chungwon Choue, president of the World Taekwondo Federation and chairman of the Seoul Organizing Committee for SportAccord 2006. On March 10, 2005, WTF held its Executive Council meeting in the IOC Headquarters in Lausanne, Switzerland, the first of its kind as an international sports federation. The meeting was made possible with the full support of Dr. Rogge. In line with the IOC's ongoing reform policy, WTF has implemented a package of reform programs since February 2005, when the WTF Reform Committee produced a 200-page reform report. The report was approved at the WTF General Assembly in May in Madrid, Spain. Dr. Rogge arrived in Seoul on April 1 to attend both the SportAccord 2006 and the 15th ANOC General Assembly held at Grand and COEX InterContinental Hotel in southern Seoul. WTF served as the secretariat of SportAccord 2006, with WTF President Choue working as chairman of the Seoul Organizing Committee for the 2006 SportAccord. WTF took the initiative to win the right to host the 2006 SportAccord international sports convention at SportAccord 2005 held in Berlin, Germany. The next SportAccord will be held in Beijing, China in late April 2007, with the exact date to be announced next week. "Dr. Rogge and so many other IOC members spoke well of the taekwondo performance during the opening ceremony of SportAccord 2006 on April 3," Dr. Choue said. Dr. Choue added, "By successfully holding a big international event like SportAccord, we can show the global sports community our ability to host and organize it."